Caption: A map of the cosmic microwave background radiation (CMB) made by the Wilkinson Microwave Anisotropy Probe (WMAP). Dark matter and dark energy are two of the mostmind-boggling ingredients in the universe. Ever since these concepts were firstproposed, some astronomers have worked feverishly to figure out what each thingis, while other astronomers have tried to prove they don't exist, in hopes ofrestoring the universe to the more understandable place many would like it tobe. A new look at the data from one of the telescopes used toestablish the existence of this strange stuff is causing some scientists toquestion whether they really exist at all. Yet other experts are holding firmto the idea that, whether we like it or not, the "dark side" of theuniverse is here to stay. Dark matter is a proposed form of matter that could make up22 percent of the universe's mass-energy budget, vastly outweighing all thenormal matter, like stars and galaxies. Astronomers can't observe dark matter directly,but they think it's there because of the gravitational pull it seems to exerton everything else. Without dark matter, the thinking goes, galaxies would flyapart. One of the prime ways researchers tally how much thesecomponents contribute to the overall makeup of the universe is by measuring adim glow of light pervading space that is thought to be left over from the BigBang. 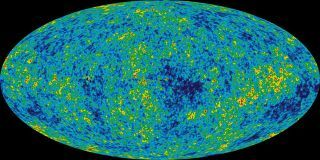 The most detailed measurements yet taken of this radiation, which iscalled the cosmicmicrowave background (CMB), come from a spacecraft dubbed the WilkinsonMicrowave Anisotropy Probe (WMAP). "It's such an important thing — the microwavebackground," said astrophysicist Tom Shanks of Durham University inEngland. "All the results in dark energy and dark matter in cosmology hangon it, and that?s why I'm interested in checking the results." Recently Shanks and his graduate student Utane Sawangwitwent back to examine the WMAP data and used a different method to calibrate howmuch smoothing, or blurring, the telescope was causing to its images. Thissmoothing is an expected affect, akin to the way Earth's atmosphere blursstars' light so they twinkle. Instead of using Jupiter as a calibration source, the waythe WMAP team did, Shanks and Sawangwit used distant astronomical objects inthe WMAP data itself that were emitting radio light. "When we checked radio sources in the WMAP background,we found more smoothing than the WMAP team expected," Shanks toldSPACE.com. "That would have big implications for cosmology if we wereproven right." If this smoothing error is larger than thought, it couldindicate that fluctuations measured in the intensity of the CMB radiation areactually smaller than they originally appeared. The size of these fluctuationsis a key parameter used to support the existence of dark matter and darkenergy. With smaller ripples, there would be no need to invokeexotic concepts like dark matter and dark energy to explain the CMB observations,Shanks said. The researchers will report their findings in an upcoming issue ofthe journal Monthly Notices of the Royal Astronomical Society. Yet other astronomers, particularly those who first analyzedthe WMAP results, remain unconvinced. "The WMAP team has carried out extensive checks and weunequivocally stand by our results," said WMAP principal investigatorCharles Bennett of Johns Hopkins University in Baltimore, Md. The WMAP researchers take issue with Sawangwit and Shanks'use of dim, far-away radio sources to calculate the telescope's smoothingerror. "These are weak sources, so many of them must beaveraged together to obtain useful measurements. None of them move with respectto the CMB," said WMAP team member Mark Halpern of the University ofBritish Columbia. "This method is inferior to our main approach." Plus, Halpern said he and his colleagues had identified anerror the other team made in failing to account for the confusing contributionof the CMB ripples themselves. "We can obtain the Shanks result by omitting the stepthat properly accounts for the background confusion, but this step isnecessary," Bennett explained. Back in this corner ? Yet Shanks said he's aware of these objections and stands byhis calculations. "We don't think that's an issue," he said. Ultimately, Shanks hopes future measurements of themicrowave background radiation from new telescopes will help clear up theissue. The European Space Agency's Planckspacecraft, launched into orbit in 2009, is currently taking new, even moredetailed observations of the CMB. "I'm very interested to see what Planck gets in termsof its results," Shanks said. "And of course we will be there to tryand keep everybody as honest as possible. We're hoping we can use our methodsin the same way to check their beam profile that they ultimately come upwith."